January 29th Thomas Young is offering a Jazz Voice and Cabaret Master Class in NYC! There is limited enrollment for singers AND auditors! TRUE VOICE NYC is hosting this event and all the registration and important info in available on their website. 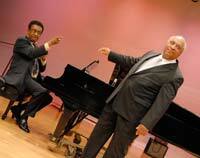 Mr. Young brings 40 years experience in jazz idioms in 30 countries of performance! He has worked with many of the great jazz musicians of the 20th and 21st century! Whether you are a beginner in jazz idioms, curious to explore more or a seasoned professional who just wants a tune up - this is YOUR class! You will also be able to purchase an edited recording of your work from True Voice to use as a teaching tool, a possible clip for your website or whatever you wish! Here is Mr. Young's Twisted on youtube. A special registration rate til January 1st available. Registration available til the class fills. REGISTER NOW!!! Singers and Auditors! Just sent this to a friend!!!! thanks Jess! Gonna be a great class!